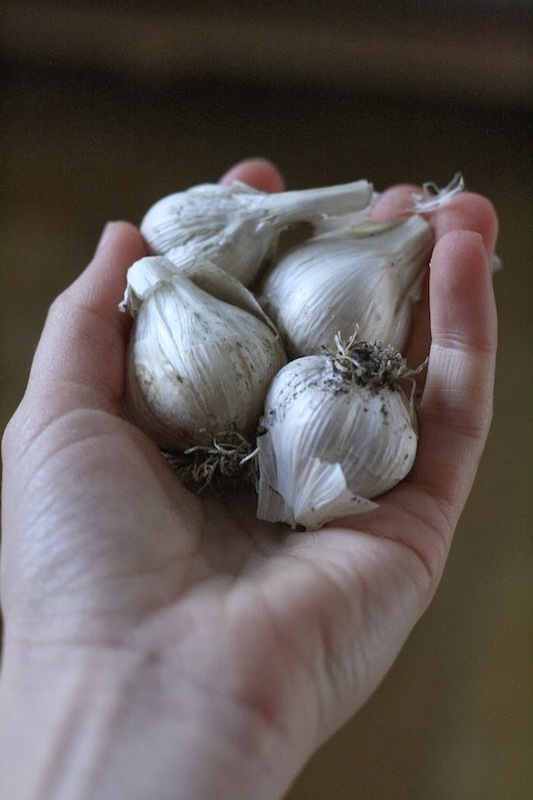 Garlic is one of those rare, easy but also incredibly rewarding plants. Raspberries are like this, and arugula. I can't think of many others. The thing about garlic is that it requires your attention in the fall. After the tomatoes are ripped out and the potatoes have been dug and all that's left are greens and maybe a few beans drying on the vine, that's when you plant. You tuck tiny cloves into the ground, cover them with mulch, and wait. There's nothing else to do til harvest time. Peter Burgess farms about a quarter acre in Truro. This year he planted 6,000 bulbs of garlic—almost all of them rare or unusual varieties. Some of them he tracked down on eBay, others through growers in Washington and Oregon. It's taken him months. Now that they're in the ground, he's in the waiting phase—musing over the delight of having something all ready to go come spring. These are his garlic beds, a mosaic of green sprouts and dark seaweed and bright snow. While we all wait for planting time, Peter shared his notes on garlic with me. I've posted the varieties he's growing below. You can plant in the spring, Peter says. It's better to plant in the fall, because your bulbs will be bigger, but it's not too late. As he put it, it's better to plant in the spring than not to plant at all. PYONGYANG: From North Korea. 6-8 cloves per bulb. Exceptionally fine flavor, hot and crisp raw, nutty and richly flavorful sauteed. Pleasant and nutty baked. AJO ROJO: Beautiful red-burgundy color. Excellent sweet, strong taste, particularly after storage. Harvest late for best flavor. BURGUNDY: As beautiful as the name implies. Bulb wrappers are a lovely deep rose color. Prefers a warmer climate than most garlics. Excellent sweet, rich flavor. KEEPER: Longest storage quality of all the hardnecks. Tan skin on the outside, but beautiful crimson color inside. Excellent garlic flavor. AYACUCHO: Extremely rare, from Peruvian Andean Plateau. Averages 7 cloves per bulb. KAZAKHASTAN: One of the earliest varieties to mature. From central Asia...tall, strong plants with 7-8 large cloves each. OREGON BLUE : "A real producer." Good yield, and good storage variety. Hot, pleasantly spicy. GEORGIAN CRYSTAL: Robust flavor that's mild raw and buttery roasted. Originates from the Republic of Georgia between the Black Sea and the Aral Sea. ROMANIAN RED: 4-6 "monstrous" cloves. Medium hot raw...very flavorful. Will store well up to 6 months. VOSTANI: Classic bulbs, white with a pink overaly. Collected from an elderyly farmer living near the Washington-British Columbia border. Lively and pungent. ZEMO: Large cloves, 3-4 max per bulb. One of two favorites in Cook's Illustrated America's Test Kitchen. Powerful raw. PSKEM: Originally collected by Seed Savers Exchange member John Swenson in 1989 from the Pskem River Valley in Uzbekistan. Hot when raw...good depth of character. CHESNOK RED (SHVELISI): Excellent for baking. Late season harvest, characterized by beautiful purple stripes. One of the best all-around cooking varieties. TURKISH GIANT RED: Great for storing. Bright red bulbs. Robust garlic flavor. PESCADERO RED: Also called "Fisherman's Garlic." Mild, mellow, sweet and rich flavor. Long storing. ESTONIAN RED: Large bulb with purple stripes. Nice smooth garlic flavor . . . tingly on tongue raw". VEKAK: Particularly rich sautéed...a mainstay in Peter's kitchen. From the Czech Collection of New York grower, Dr. Boris Andrst. BOGATYR: Fire extinguisher hot. Large bulbs. Spicy! HNAT: Very hot...great in salsa." MONTANA GIANT: Strong lively flavor, easy to peel. ONTARIO GIANT (PUSLINCH): Complex full flavor with rising heat. Very rare. RUSSIAN RED: Peter's favorite...deep character with sweet, full taste. Intense flavor when raw. Heat is long lasting. SPANISH ROJA: One of the best garlics, ranked in top two or three. Large, flat bottomed cloves. A vigorous grower with large foliage. No other garlic surpasses its flavor. YUGOSLOVIAN: Strong garlic aroma. Very popular. THAI FIRE: Makes excellent garlic powder. Clove skins are dark nut brown. Complex flavor with rising heat. KITAB: Closest to wild garlic...wholly unique. Finally, if you find yourself getting garlic obsessed, he wanted to recommend this book. It's called The Complete Book of Garlic, and as Peter observes, "It's complete all right." It profiles nearly 150 cultivars and covers the natural history of garlic, the history of garlic cultivation, therapeutic benefits, plant structure, and tips on how to cultivate, cure, and store garlic, and a whole lot more. Happy reading, everyone. Vampires apart garlic is one of the most famous herbs around today. It's use in healing goes back to Egyptian times, and despite all our modern medicines, many people still endorse its reputation as a herbal remedy for preventing everything from the common cold and flu through to the Plague! If you have a newspaper beat to cover, make it fun and get to know those you'll be covering. A food beat is no different. Know food and your local food trend-setters.For the more information sourkitchen.